On 4 September 2017 the North-West University’s (NWU’s) campus in Mahikeng hosted a Setswana-ka-Setswana seminar to honour the contributions made by Prof SE Setshedi and the late Prof RM Malope, both leading Setswana language pioneers. 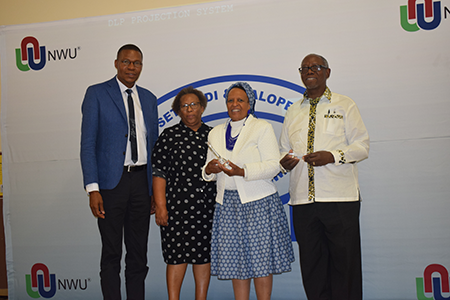 The seminar, organised by the School for Setswana and led by the executive dean of the Faculty of Humanities, Prof Marilyn Setlalentoa, also sought to generate interest in the development of African indigenous languages for higher education. Another goal was to encourage the study of indigenous languages and Setswana in particular as a form of preservation of not just the language, but also the culture of many Setswana speaking people in South Africa and abroad. “When indigenous languages are used to acquire education, it contributes largely to the growth of such a language,” says Ms Elieen Poee, a senior lecturer in Setswana. “This promotes the provision of resources such as funding, books, electronic technology and physical infrastructure. The development of indigenous languages in teaching and learning and research in particular Setswana, gives its custodians and people a stronger sense of identity and facilitates higher-level learning for students. During the seminar various cultural artefacts associated with the culture of Setswana-speaking people were displayed, as well as published works such as Matlhoko, Matlhoko and Mmualebe by Prof Malope, and Masope a Mabedi and Mosekaphofu by Prof Setshedi. Delivering his vote of thanks, Prof Dan Kgwadi, the vice-chancellor, said “It is truly humbling to be honouring my two personal mentors on this day. Prof Malope and the late Prof Setshedi are pioneers in the activism of language and cultural preservation of our time. “Culture is inextricable from language, and the failure to recognise either one is a failure to fully appreciate the magnitude and weight of what makes a people. “This phenomenon was fully understood by these two professors, and I suspect that is what fuelled their lifelong tenacity in developing the Setswana language and inadvertently, its culture. Prof Dan Kgwadi, Prof Marilyn Setlalentoa, Ms M Setshedi and Prof Racious Malope.